How do I select the correct Filtermist Model for my application? We have a database of previous installs on many different models of machine tools. Also, if you can provide us with the interior volume of your machine in cubic feet and some details about your application we can make a recommendation. 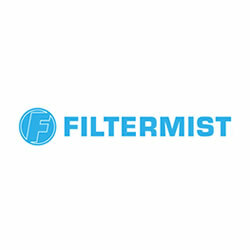 How do I install the Filtermist unit on my machine? Units can be direct mounted on top of the machine, side mounted with a mounting bracket, floor mounted on a stand next to the machine etc. How often do the drum pads need to be changed? The instruction manual that is included with each unit details the maintenance requirements. It is recommended to change the pads every 1000 running hours. for many years without ever needing to change the drum pads. Can I use one Filtermist Unit to service more than one machine? How will my Filtermist Unit ship? Most Filtermist Units can ship via courier, however, when ordering multiple units and accessories it is often more cost effective to ship by truck.